Jerry Perenchio was a media mogul, billionaire former owner of Univision and the producer behind a slew of hit shows and sporting events but his house appeared more often on TV than he did. Press-shy mogul transformed struggling Univision into broadcasting juggernaut; today world's leading Spanish-language broadcaster. Bought channel from Hallmark for $550 million in 1992 with Latin American partners; sold to a Haim Saban group for $13.7 billion in last year. "Jerry" began as talent agent for MCA. Created Embassy Communications with former TV producer Norman Lear (All in the Family), sold programming interests to Coca-Cola for $485 million 1985. One of largest landowners in Malibu. Said to have raised more than $500,000 from relatives and associates for John McCain's presidential campaign. Perenchio, 86, died Tuesday May 23 2017 of lung cancer at his home in Los Angeles, his wife, Margaret, said Wednesday. Perenchio’s half-century in the entertainment business included talent agent, sports promoter, television and motion picture tycoon but he preferred to work behind the scenes. His wealth, recently estimated by Forbes at $2.8 billion, allowed him to be a generous political donor and philanthropist. He contributed some $50 million to candidates and causes and tens of millions more to schools, hospitals, museums and charities of all types. He amassed a significant art collection that included work by Picasso, Cezanne and Monet and in 2014 announced he would bequeath 47 pieces — worth an estimated $500 million — to the Los Angeles County Museum of Art. He also donated $25 million for a new building to house it. Scion of a Fresno winemaking family, Andrew Jerry Perenchio wore many hats during a half-century in the entertainment business. He turned to show business after attending UCLA and serving in the Air Force as a jet pilot and flight instructor. n the late 1950s he became a talent agent with Music Corp. of America, the legendary agency run by Lew Wasserman. He went on to start his own agency, later merging it with another and representing movie and music stars such as Marlon Brando, Elizabeth Taylor, Andy Williams and Glen Campbell. As a sports promoter he helped engineer the 1971 “Fight of the Century” between Muhammad Ali and Joe Frazier as well as the 1973 “Battle of the Sexes” between tennis players Billie Jean King and Bobby Riggs. Lear once described his partner, who handled the business end of things, as a man of great creativity and vision. Together they acquired a film studio, Avco Embassy, for $25 million in 1982, and merged it with Tandem to create Embassy Communications. Three years later, they sold Embassy to the Coca-Cola Company, which owned Columbia Pictures, for $485 million; the acquisition allowed Coca-Cola to capitalize not only on the production of continuing series but also on the popular shows’ lucrative syndication rights. In 1992, Perenchio and two Latin American media tycoons bought Univision, then a struggling Spanish-language network. He became chairman and chief executive of the company, which today is the fifth-largest network in the United States — before selling it in 2006 and reaping a personal paycheck of over $1 billion. Perenchio used some of his fortune on property, at one point becoming among the largest landholders in Malibu. He bought his Bel Air mansion in the 1980s and last year paid $15 million for the home of late neighbors Ronald and Nancy Reagan. 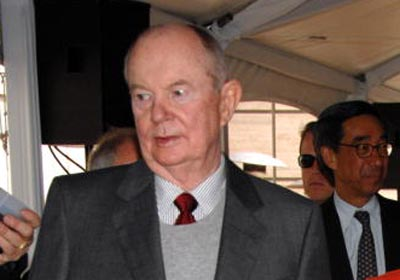 Mr. Perenchio is survived by his third wife, the former Margaret McHugh; a son, John, from his first marriage, to the former Robin Green; two daughters, Catherine Wandel and Candace Lee, from his wife’s previous marriage; five grandchildren; and three great-grandchildren.